Perfect for cooking meat in bulk, staying warm, and providing light. Powered by Gasoline. 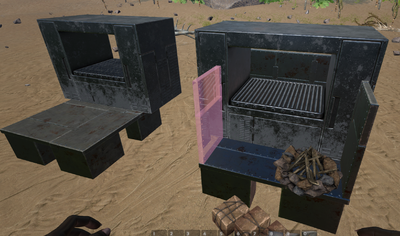 The Industrial Grill is a structure in ARK: Survival Evolved used to cook meat. It also heats the player, and lights up a small area when lit. The Industrial Grill can be lit when Gasoline is placed into its inventory and activated by pressing the 'Use' key (default e). Holding the 'Use' key will open the radial menu where the player can choose to open its inventory, turn it on, or destroy it. The grill offers up to a maximum of +186 hypothermal insulation and -19 hyperthermal insulation standing directly in front of the structure. This would result in approximately +200 hypothermal and -20 hyperthermal insulation standing right in the middle of the heat source. The effect is reduced by distance from the grill. One piece of Gasoline will keep the grill burning for 20 minutes. During this time it can be used to create 760 pieces of Cooked Meat and Cooked Prime Meat. The tradeoff for being able to cook meat very quickly compared to the campfire is that gasoline is much harder to come by compared to thatch, wood and sparkpowder. It is, therefore, not efficient to use the grill unless you have large quantities of meat (760 raw meat is 38 stacks of 20). This can be achieved over time with a refrigerator or two preserving bins, or just from a hunt with a dino like a Rex or a Therizinosaur. 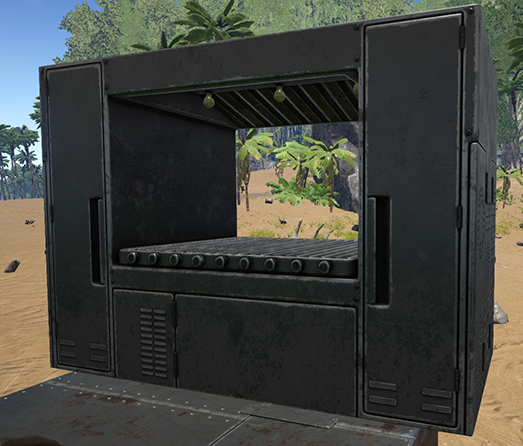 The industrial grill is indispensable for cooking the large quantities of prime meat obtained from an alpha predator before it spoils. The Industrial Grill's name is well-deserved. The amount of meat produced by the grill exceeds even a large number of Campfires due to its faster cooking time and its ability to produce several units at once; not to mention the easier handling. The following table gives an overview of estimated cooking time based on an original measurement of 12 × Cooked Meat in 18 seconds: Measurement for 980 meat was performed manually, but individual results may vary due to small amounts of server lag occurring several times over long periods of time. Note that when cooking 980 meat, the last stacks to be cooked will lose 2 × Raw Meat to spoilage, as Raw Meat spoils once every 10 minutes. If the player decides to really make use of the extremely long burning time, the grill is able to provide about 2570 × Cooked Meat per hour. This exceeds the amount of stacks one Refrigerator can store. Having a second refrigerator is therefore highly recommended. The Industrial Grill is not currently paint-able, however this object may be re-mapped to include paint regions in a future update.